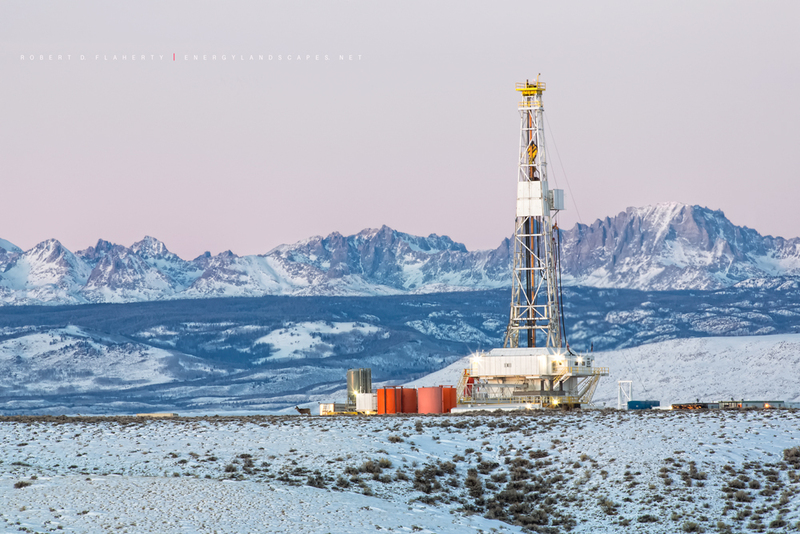 A large mule dear appears to stand guard in front of Unit Corp. drilling rig 125 operating in The Wind River Mountains of Western Wyoming. Each year herds of antelope and mule dear come down from the heavy snow pack of the Tetons and Yellowstone National Park to winter over in this area. Over the years exploration has decreased with natural gas prices and now only a few rigs remain. With the introduction of wolves to the area the mule dear now can now been seen using the the remaining rigs for cover. Fine art oil & gas photography by Robert D. Flaherty. Photo © copyright by Robert D. Flaherty.